Example of a Smith Chart. 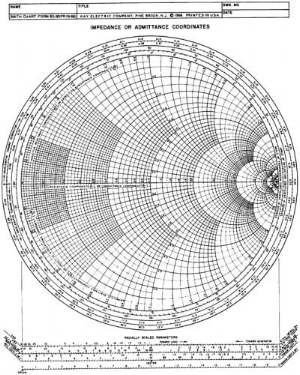 A Smith Chart is an electrical engineering graph that simplifies complicated radio frequency computations. Two overlapping and inverted Smith Charts are used to map out holes in the wall. As I cut or drill through the walls, underlying layers of paint emerge in a stratigraphic arrangement. Earlier installations in the gallery become part of the work, and previous artists my unwitting collaborators. Radio frequencies allude to remote communication and human connection. An approach that feels both aggressive and delicate, . . . The serrated edges around the drilled holes suggest violence, wounds, or scars. It is in the precinct of this purposeful paradox that seduction resides, variously analyzed and rhapsodized by philosophers and poets.